It all started with one reclining chair back in 1928: with the idea to provide the best furniture pieces in Michigan, the founders of La-Z-Boy gradually achieved success first in the US, and then in Canada and Australia, among the other countries. Although numerous customers recognize them due to their unique and state-of-the-art reclining chairs, La-Z-Boy has definitely some great things to offer to each customer who seeks comfort for themselves and their loved ones. Starting with statical chairs, sofas, sleeper sofas, and lift chairs, just to name a few categories of furniture you can find in one of their galleries, this household brand made themselves famous thanks to their devotion and willingness to do the unthinkable in the world of furniture. One of the inspiring and truly imaginative pieces of furniture are La-Z-Boy sofa beds, couch beds with refined design and supreme mattress quality. With endless customization options offered by La-Z-Boy, even needy sleepers can find sleeper sofa that will meet all the standards. Thanks to their high-quality built, these sofas provide the best value for the money on the market. But it’s not just quality, design, and popularity. This particular La-Z-Boy furniture line is layered with different benefits for the customers, no matter how high their standards are. Is La-Z-Boy The Only Brand You Should Consider? Before we dive into the amazing 2018 la-z-boy sofa reviews, let’s outline the criteria we used to compare the following items. The quality of the material, the mattress, and the built was our number one criteria for selecting and analyzing these particular pieces (which we’ll talk about in a bit). 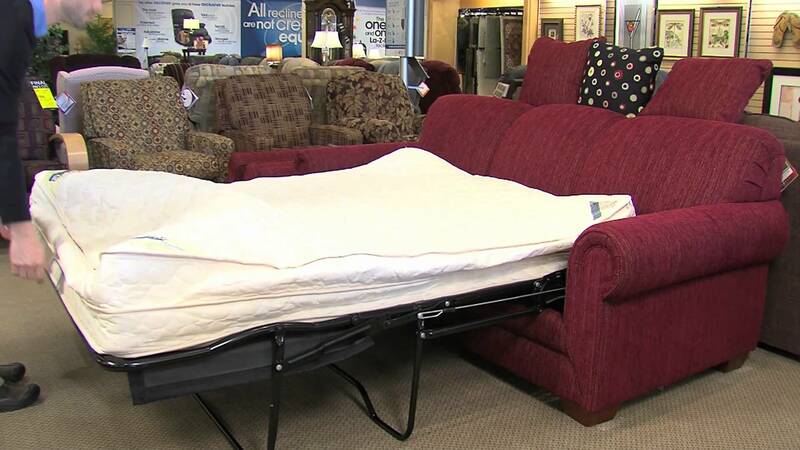 We believe that any couch bed should be a high quality piece of furniture because there’s no price on one’s sleep. And we were surprised by the fact that the quality of La-Z-Boy sofas was the number one factor that resulted in high ratings and positive feedback. Besides the quality, we also took a look at design and functionality. All the products we’ve analyzed were excellently executed in the sense of design. Some of you might find it non-creative because it’s basically the same shape but with different color patterns, especially if you expect additional pieces like chaise or sectionals. However, if you compare the functionality of a sectional with one of the sleepers from this guide, you will find that the simple design can offer you more space and convenience in your living space. Finally, the prices of the sleepers were also taken into account when reviewing them. The high-quality design of each won’t give you any doubt about the price, and that’s something that makes this brand so popular among the buyers. Let’s go to la-z-boy sleeper sofa reviews, and find out more about what these premium products have to offer. The Supreme Comfort Technology used in designing Leah sleeper sofa provides countless relaxing and warm nights to everyone, regardless of their sleeping habits. 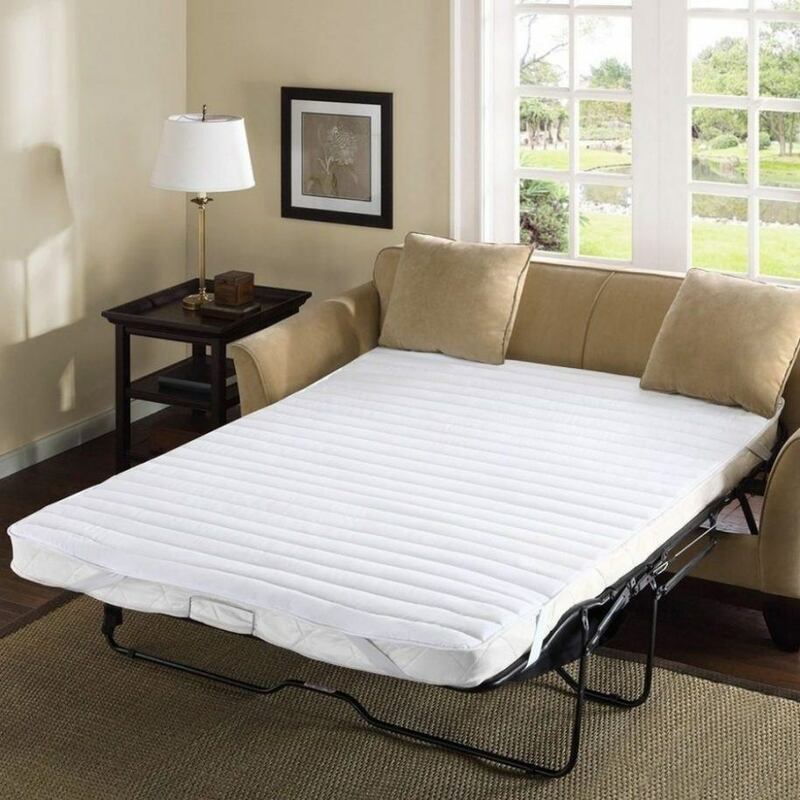 Ultra quality innerspring coil mattress offers a reliable support for your back and neck. The cover is made of quality materials, which makes sitting on it extremely comfortable. Additionally, you get to choose among various color and patterns, which will make the entire experience of purchase more personal and creative. Since the sofa is the centerpiece of the room, you will find it appreciative to play with your imagination in pursuit of the color that will match your room perfectly. This full la-z-boy sleeper sofa is very functional but it doesn’t lack the feeling of space both when sitting and sleeping. It’s a must-have for each home that’s designed with taste – and it will be extremely helpful when guests come over. The details like curled roll arms makes it look sleek and fashionable. The price reflect the level of craftsmanship invested in designing this beautiful and unique piece of furniture. Step aside – it’s time to meet the Queen among la-z-boy sofa beds. Or at least one of the queens. Leah Premier Supreme Comfort Queen Sleep Sofa is definitely one of the most popular and most desirable pieces of furniture among the buyers. Although it offers similar design and comfort level like the previous sofa, the size of this sleeper will make a difference for those who wants it all or nothing. Slightly more expensive than the previous couch bed, Leah Queen Sleep Sofa won’t leave you disappointed. With all the comfort and the premium features, you will get the ultimate quality sofa to uplight your guest room, living room, or even a bedroom. Another queen that will make you feel extatic to go to sleep each night. Kennedy Queen Sleep Sofa reminds us of classical and clean design as a way to express a lifestyle. If you lust for comfort beyond any standard, then it’s a piece of furniture you must have. As all the other sleepers, Kennedy is also available in various colors, patterns, and fabric. The quality of the material makes is easy to clean, so it’s a great match for families with kids or pets. The innerspring coil mattress gives you night full of peace and warmth – the sleeping on this sofa is so comfortable that you’ll never want to leave the bed in the morning. Besides the comfort and high-end design, the greatest benefit of having this la-z-boy sofa bed lies in the fact that it’s one of those rare pieces of furniture that will serve you loyally through the end. There’s no worry that you’ll get the best value for the money for a handmade Kennedy Premier Sleep Sofa. Amanda in a midnight blue cover makes the centerpiece of every girl’s living room. There’s something in the design that will capture anyone’s attention – almost like you’re looking into a diva and not a sofa. Back pillows are giving you right support for your back while sitting. There’s enough room to pamper two or three adults, and the mastery of practicality used to design this piece of art still leaves in wonder. However, if you expect to have all Amanda’s amazing features at the low price, you will end up disappointed. Supreme Comfort mattress that’s used for this couch proves itself in giving the best possible neck and back support without saving on the quality of the material. Although some might find that memory foam mattress is far more superb option for sleeping, the rest is satisfied with coil mattress that’s used for this bed. Isn’t it fun when you get the chance to go back to the past and explore the exciting and beautiful designs in your home? Beacon Hill is one of those sofas that reflects the look of the classical slipcover sofa, which was popular some while ago. And when you get the chance to find a twin chair or table – your home will look harmonious and attractive. Details play an important role in Beacon Hill design. Accent pillows suit perfectly with soft rolled arms, making the entire sofa look flamboyant and stunning. Although this piece of furniture is not cheap, you will hardly resist the urge to own it due to its elegance and comfort. And it’s definitely the La-Z-Boy sofa bed that withstood the test of time and kept that same genuinity to it since the day it was crafted. Romantic and flirty, Amy Queen Sleep Sofa will make you fall in love with her instantly. Don’t worry – this love at first sight will last forever because Amy know what she has to offer. High-quality cover that can easily be maintained and cleaned is just the right thing for busy moms and business women who just want to sit and relax on their favorite couch. Flared roll arms gives that spacious look to this sofa, making you feel more relaxed and satisfied while sleeping. The price couldn’t be better – don’t have to wait for sale to get this little cutie home. Although you might wonder what Amy Queen Sleep Sofa has to offer besides the mattress quality and sleek design, take a moment to imagine it in your room. Wouldn’t it fit perfectly right next to the window? Slightly smaller sized sleeper sofa, Madeline shouldn’t be underestimated. For those of you who enjoy the 1950’s lifestyle, you will find this one being just the right match for your new themed room. Again, La-Z-Boy designers know how to use details to enhance the entire appearance of the furniture, and Madeline is probably the best piece in this category. The quality mattress and fabric will provide you will a good night sleep without feeling sore or stressed in the morning. Be certain that Madeline won’t leave you disappointed – if you choose to buy this sleeper bed, prepare for the ultimate sleeping experience you ever felt. Sounds like La-Z-Boy is the only brand there is? Of course it’s not. The reality is that you will fall in love with their simplicity, quality, and comfort but there’s definitely some other brands that you should consider. To find out more about them, please check out our full buyer’s guide for sleeper sofa reviews, where you will find fresh and valuable info on other brands and their products. 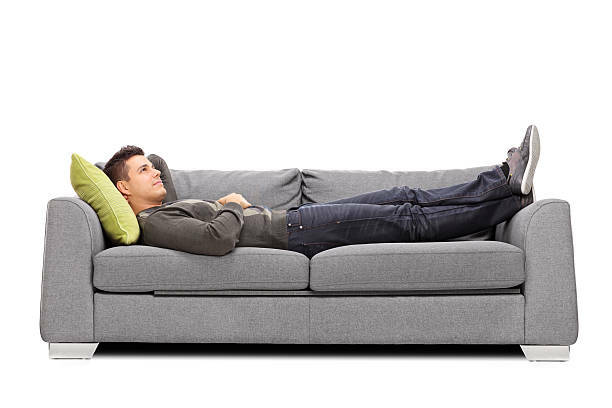 In the meantime, take a look at our pick of the top la-z-boy sofa beds for this year.